World War hulk all over again! I’d have to give it to Blue Marvel. His physical strength alone would pull him through, but it wouldn’t be easy. I must have been living under a rock, with all these black supermen you refer to! Red Hulk if written by Jeff Loeb is unstopable. That said it depends on whose writing I can see BM taking him down but it’ll be tough Because BM always needs to get a second wind to fight seriously. 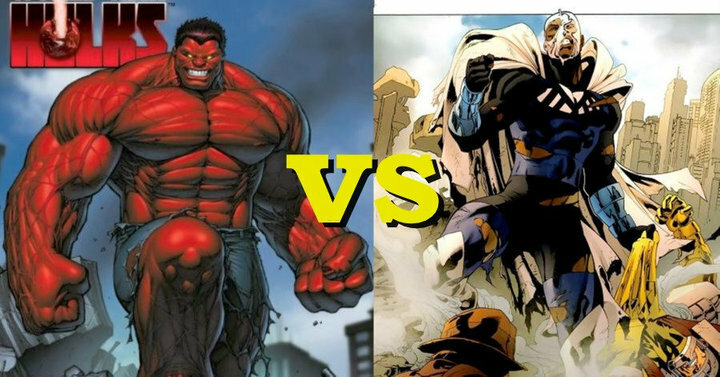 id say BLUE MARVEL all the way. he is smart strong and has lots of courage. not to mention his energy blasts alone whould probably mean the red hulks skin. I forget which comic it was, but there was a panel where Blue Marvel had defeated a host of powerful foes, including Red Hulk. I think it was Fear Itself.